On the 17th episode of The Hockey Writers Podcast, Brandon Share-Cohen stops in to chat the news of the week in the NHL and we take a few minutes with Jonathan Willis of The Athletic to talk the Edmonton Oilers, their hopes for the playoffs, an 8-4 victory over the LA Kings and future franchise decisions. Brandon and I chat the Paul Byron fight that resulted in what looks to be a pretty serious concussion. Is this the way the NHL code really works? Agent JP Barry seems to think it need revisiting if so. We also cover a few other news items such as Andrew Ladd out with a torn ACL and what the scoring race will look like over the last few games of the season. 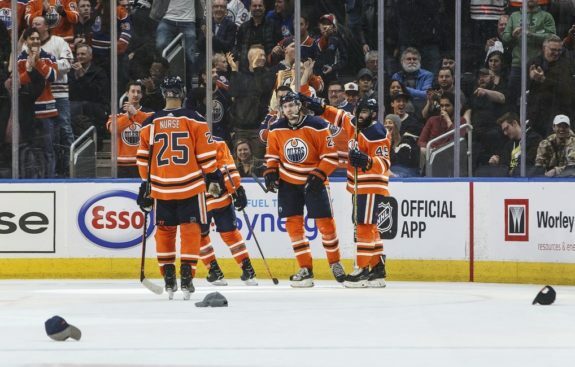 Jonathan Willis stops in to chat the Edmonton Oilers. Recently winning an 8-4 decision over the LA Kings, the team looked to be clicking on all cylinders. Why now? What does it say that a team with so much talent still might not make the playoffs? How will a new GM fix things and what were Willis’ thoughts on the whole Bob Nicholson calling out Tobias Rieder situation? Willis also talks about the right deal for a player like Alex Chiasson, the coaching situation and whether or not Ken Hitchcock is still the right guy and Willis mentions a couple names the team should consider for new GM that many pundits aren’t talking about.